When I was a kid I attended Catholic Grade school. 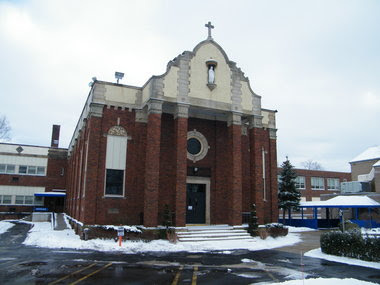 Immaculate Conception helped me become the man that I am today and I did make some good memories there. School is very different now than it was then, but I did receive a good foundation in skills that I would need for high school. I am sharing these moments from my childhood to remind me of the parts of school I did enjoy and to show how I came to some of the conclusions I did today. I hope to share some of the moments with my teachers who inspired me to become a member of their profession. So many good teachers were swept under the rug of the reforms that happened during the No Child Left Behind Era. Sometimes I think we forget there was a time where teachers worked hard, taught children, and inspired them to live their lives on their own terms, without the threat of the assessments of doom that ripped away funding. They did the job because they believed in it in some shape or form. They wanted me to grow up to be a productive human being. They wanted to have a hand in that future. They wanted to help mold the next generation of doctors and lawyers and teachers, etc, etc, etc. And they did it all because they believed in doing the job not because someone constantly threatened to fire them. Think about that. I am writing this because someone thought I should know how. That is where it ended. To me that is powerful stuff. One of my favorite times of year was during Catholic Schools Week. The week was a celebration of Catholic Schools across the nation and all week we had special events that made school so much fun. All throughout the week there were fun games we played, events that involved the entire school, the book fair, and one day where a parent was allowed to bring in food to share a meal with us during the day. I think the day that was my favorite was the day that my Mom brought lunch to school and we would share that lunch on a blanket in the gym. At the school I went to we didn’t have a cafeteria and hot lunch was a special treat that was available once a month. The hot lunch was usually pizza from the same pizza location and, to be frank, it was just ok. Having milk with pizza was never all that tasty and we did get different kinds of ice cream on those days, but you had to eat the ice cream first before it melted and by then the pizza was kind of cold. I always ordered it because I enjoyed getting something different once a month. But when Catholic Schools Week was in session my Mom would ask us what we wanted and it included any kind of fast food we could request. I usually would request Burger King or maybe McDonald’s chicken nuggets, which were a foods that were reserved for special occasions. The lunch itself was really nothing all that special except for food that I requested to eat with my Mother and so was seeing her during the middle of the day. There were times seeing her was not so great, like the time in first grade we went to look at my classroom after lunch and on the sticker chart I had very few stickers for good behavior compared to all the other kids full sticker charts. (We had an interesting conversation that day…) But mostly I enjoyed seeing my Mom and enjoying a nice lunch with some good conversation, before showing off some of the things I did in school with pride. The hardest part was eating lunch in twenty minutes, since that was how long we got to eat and everyone was always rushed, but that was the policy of the school. Another aspect of the lunch that I enjoyed was that I also was able to see my brothers during the day. We all attended the same school by the time I was in Junior High/Middle School and it was nice to see them during the day. We normally were all in different sections of the building and couldn’t see one another, but on the CSW Lunch day it was special and we all could get together to share a meal. My Mom took requests from all of us and she picked up whatever we wanted, even if the restaurants were located in different places across town. Other times my Dad also came when he switched jobs to a new firm near our house. It was nice to see him as well, but most of my memories involved just seeing my Mom because my Dad worked about an hour’s drive away from our house. My brothers got to see him more at these functions because he worked so close he could come home for lunch, but I was on my way out the door at the time before Dad making an appearance became a regular occurrence. My Mom really made the day special, which we always capped off by going to look through the book fair after lunch. She would let us go through the entire thing and pick whatever book we wanted. Both my parents always valued reading, but my Mom must have been determined to make sure we all were sound readers. She always took us to the library during the summer so we could participate in the summer reading program, which always had fun little prizes after reading so many books. She also helped us pick out books when we were younger and when I once said I had no idea what to read, but I loved sports she talked with the librarian one day that I didn’t go to the library with her to find middle school books on sports. I still remember one being about a soccer goalie who wasn’t very good, but had his moment in the sun when he made the game winning save and a really interesting book called the Tennis Menace, which I really enjoyed reading. Thanks, Mom! Needless to say, when it came to the book fair my Mom was always supportive and offered to buy us all one book each. During the year we never really received gifts and most of the books we did get were usually presents at Christmas, our birthdays, or some other holiday. I always took care to pick out a book that I liked, usually picking some kind of sci-fi adventure like the time I picked a fun Hardy Boys/ Tom Swift Ultra Thriller that I read like a million times. Other times if we didn’t find anything my Mom kept her word and took us to Borders or Walden’s Books to make a selection, such as the time we went to the mall and I picked out Jurassic Park that I ended up reading until it was worn. Once we picked out our books it was usually time to go back to class, since recess had ended. (30 minute recess = 30 minute teacher lunch. Not much has changed I guess.) If we had time I usually took my Mom to look at my classroom and talk with my teachers, but usually it took a while for all of us to pick out a book. So once the bell range we usually parted with her, giving her a quick hug, and saying good bye. Going back to class was always hard because the last thing I wanted after having a nice lunch and getting a good book was to learn other things for what felt like eternity. In reality though it was not even two hours before the day ended and I went home to see her again. All in all, this day was one day a year that was just spectacular. Sometimes I wish I could do things like that again. They were so much fun! Thanks, Mom for making it special! Do you find a lot of students using the blog?